Goosebump helps its users find live music events. We plan to become the leading marketplace to find, promote and sell tickets for live music events. We leverage technology to help the live music scene grow, by informing attendees about what’s going on in their city and bringing people in organizer events. Because we believe live music experiences have the power to bring people together. We believe this is the last tribal experience, allowing people to connect around share values, excluding traditional social norms. We believe this phenomenon is exploding because it’s never been so easy for artists to produce and promote their music, as well as for communities to gather online and organize events for themselves to share experiences offline. We believe that this emerging scene needs an infrastructure to take place, expand and sustain. If Goosebump was a human, it would be a guide. Someone who always knows everything going on to help people find events they’ll love. If as a guide we stop being effective, we are not useful anymore. We are cool. In the way we speak, we behave, we look as a brand. The most important pillar of Goosebump is its social dimension. We think that people like being informed by peers. It generates trust and the same feeling of connectedness that one’s can feel when sharing the dancefloor. As a member of Goosebump’s team, you are its brand extension. What’s important for a brand is to be consistent in its tone, both verbally and visually. It means that each time you speak in Goosebump’s name or on Goosebump’s support you have to respect its guidelines. Interlign espacement: please insert invisible character to be sure you’ll have space where it needs to to avoid compact text blocks. Please. No repetition, no long sentences. Be direct. Write once, then read it back, get read of all the superfluous. Repeat 5 times. Emojis are part of our brand. To use with moderation. Partnerships helps Goosebump build relationships with local promoters, acquire new app users and create brand awareness. - Detect events on the excel sheet "PRISM" we’d like to partner with. Prioritize by number of attendings. The ultimate goal is to partner with every events organizer in every city we’re in. - Find a way to reach the organizer. Be agressive. Phone call is always better. Otherwise, send a message to the page, go on their website, find their mail address, si if you have common connections, ask the team. I’m #name, partnerships manager at Goosebump. Goosebump is a going out guide. We help more than 50,000 people finding events every week across 16 cities in Europe including #city, Paris, London, Berlin, Barcelona… We recommend your events and already helped you reach our audience. - Contest within our app. Our users will try their luck to win tickets by sharing your event with at least 3 of their friends. We can reach until 5,000 people. You can download the template here. Then you just have to make a screenshot within the bot and save the cover for the background. - If you see a big event you don’t manage to deal a partnership with, talk to Raphael. - We have one spreadsheet for every cities where you have to update partners infos. Your role as a community manager is to federate the community within the Facebook group. It’s also a good way to connect event organizers and attendees. The most important thing is to see people actually discuss. This is the success metric you should look at. It is always hard in the beginning, people need to appropriate the group. A good way to make it work is to engage the discussion yourself. Bring your friends on the group and share about any topic that you’re interested about. See the group in the first place as a way to share content, advices, recommendations and emotion about the local scene with your friends. It’s even better if you can make the most influential people within the local scene your friends, and share things with them (artists, events organizers). The event organizer tend to share their event easily on the group. They’re always looking for new ways to get visibility. Take advantage of this to build relationship with them, ask them if they’d be interested in partnerships. It takes several weeks to have a really active community. A good metaphor would be the cranks that car engines had before they got electric starters. Once the engine was going, it would keep going, but there was a separate and laborious process to get it going. Here, the laborious process is to ask all your friends and team to like every post, to talk to organizers to make sure they’ll be active on the group, to engage the discussion in comments of almost every post… Keep it up! - There’s one main profile we use for every post. The goal is to make this profile friend with all the members, so that when we post something a lot of members are notified. - We have a set of recurring post. The objective is to publish one post per day. Feel free to try new things. The only way to know if a post can work is to try it. Again, think as if all the members was a group of friend you want to share with. Post 1 : « Selecta » = this is a showcase of the best 2 events of the day. The goal is to redirect members toward the bot. Day when there are no other posts scheduled. Feelings: History of New York Disco and House w/ Demuja, Dream 2 Science & much more! Unleash x Pampa Records Day & Night Party - Tickets On The Door w/ Roman Flügel, Robag Wruhme and much more! Post 2 : « What do we do this week? » = this is a poll on which members vote for their favorite events of the week. Poll is the best performing format. Exemple here. Post 3 : Poll on whatever topic you may imagine. Exemple here. Post 4 : « How was last week? » On Monday we ask the community to give feedbacks concerning the events they attended the previous week. Example here. 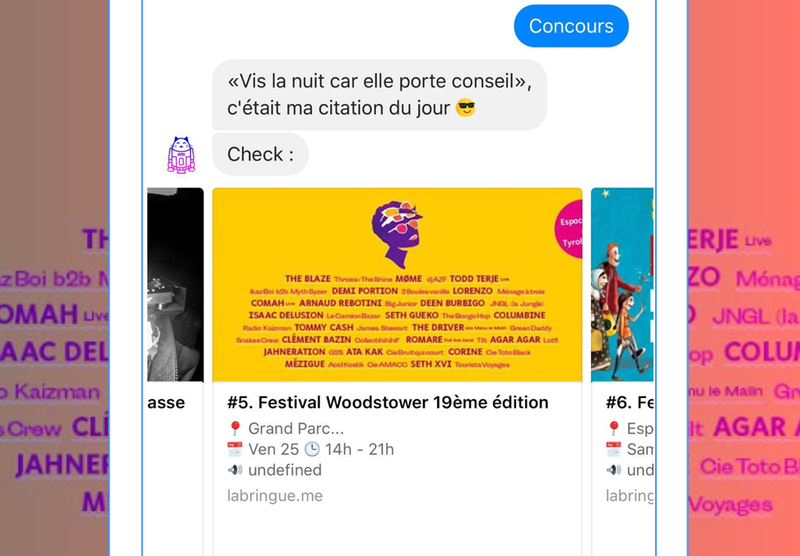 The most important things are 1 get a video of one event (with video on Facebook, replace « www » with « m », play the video, right click, « save video », then upload the video on your publication) and 2- introduce the discussion by sharing a feedback yourself. You can read the rules in the group description. Don’t hesitate to share events, recommendations and emotions about the local electronic music scene. - You manage our local team profile (i.e Jean Bringue for Paris, Berry Goose for London…). The team profile has a critical role. We use it to publish in the group, send welcome messages and talk with members and organizers. Related tasks include: add every new members as a friend, check regularly the inbox, answer private messages, publish every post in the group from this profile. As a content creator, your job is to to educate, entertain and help the audience make better decisions. Content makes people hear about Goosebump and love it. Get back to the brand guidelines to get Goosebump’s tone, this is the most important part, especially to write and post articles. Content is all about identity, quality, variety and quantity. Identity is the way we talk: always using « I », be natural, get close to the audience. Quality content required, by quality we mean a content that learns something to or entertains the audience. The editor-in-chief is the gate keeper of the variety aspect. The editorial slant must be well-balanced. Finally quantity is the key to reach the audience when we post content on social networks. We need to be consistent in terms of post frequency. One content per day per city is the right frequency. Classics: include musical content (podcast, playlist), news, EP’s / track reviews, event focus & report, interviews, humor content. Put as many links redirecting toward the bot as possible. You should have one link redirecting toward the bot in every article.